Unfortunately I didn’t get as much done as I planned during the weekend. I’ve been a bit under the weather causing everything on my to-do list to be pushed back. I’ll hopefully be working on some dining room projects later this week, but for today’s post I’m going to answer some readers’ questions about paint brushes! Q: Do I need different brushes for different types of paints? A: Yes! Technically. Natural brushes are recommended for oil-based paints while synthetic brushes are recommended for latex and water based paints. I use brushes labeled for ‘ALL TYPES’ of paints. My personal favorite brand is Purdy. Q: Why do I keep getting loose bristles in my paint? A: My best advice for this is to invest in a really good quality brush. Most people think that all brushes are the same and try to be thrifty with their tools. They end up shelling out more money trying to continuously replace cheap brushes, until they get frustrated enough to start investing in better quality tools. A good quality brush set can literally last you years if taken care of and cleaned properly after each use. Your local hardware store should have examples of different quality levels. Buy the best you can for your budget! Q: How do I clean my brushes? I’m having a hard time getting the paint out. A: This depends on the type of paint you used. Latex and water based paints can be washed out of brushes using simple soap and water, which is why I like using them. They can be washed out in a bucket or sink and rinsed thoroughly with warm water. I use a plastic detail brush or old toothbrush to get any dry paint pieces out. You can also soak your brushes in hot vinegar to remove old stubborn paint. Let hang to dry, cover, and store. Brushes used for oil based paints need to be cleaned with turpentine or mineral spirits. This is a much more hazardous and tedious clean up process. Swish brushes around in the cleaning solution until all paint is removed and allow to dry thoroughly in a well ventilated area. Turpentine and mineral spirits have irritating fumes and CANNOT be poured down drains. This goes for the paint as well. Dirty turpentine and mineral spirits can be stored in jars and taken to an appropriate hazardous waste center. Please refer to the instructions on these products for proper disposal. Q: My brush keeps drying between coats. Should I leave it sitting in the paint? A: My answer would be probably be no to letting it sit in the paint. It makes cleaning your brush harder because it had time to absorb so much extra paint. I find the best thing for me is to cover the bristles to keep them from drying out. Wrap the bristles in a piece of plastic wrap, a sandwich baggy, or even a piece of foil for longer breaks. For shorter breaks, between 10-15 minutes, I simply use a wet paper towel. Q: How do you recommend storing paint brushes? A: A lot of brushes come with a plastic or paper cover. Keep those! They will protect your bristles from damage and dust. If for some reason yours didn’t or you lost them, use the same materials I mentioned in the last question. Use foil, sandwich baggies, or even DIY a new cover out of lightweight cardboard. Just make sure you keep those delicate bristles covered! Protect them from moisture and weather by storing in plastic storage boxes or set aside a drawer in your home. 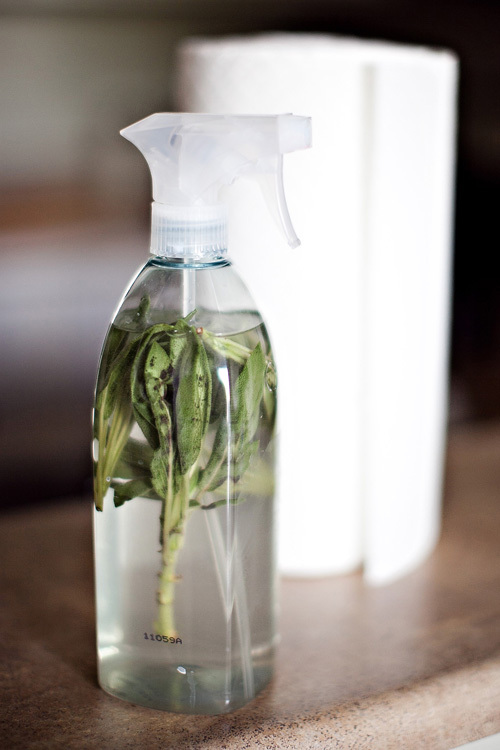 This is one of my favorite DIY household cleaning recipes. 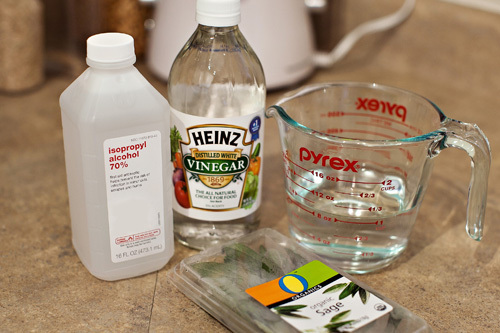 Vinegar has been a trusted household cleaner for decades and I started using this particular mixture a few years ago to clean our tile countertops and floors to avoid dulling residues. My dogs also suffer from allergies and I wanted to make sure the floors were safe for them too. It works swell on other surfaces as well. I’ll admit I love the Method and Mrs. Meyers line of cleaners because of their scents, but when those aren’t on hand, I fall back on my trusty homemade friend. In summer I like to add orange or lemon peels. You can easily use essential oils to scent your spray as little or as much as you’d like. They work a little better since the scent is concentrated. I went with fresh sage for this batch because it was over growing and needed to be used. Get a spray bottle and fill it up. If you’re recycling a bottle from a previous cleaner make sure you rinse it out well before mixing your ingredients (duh). 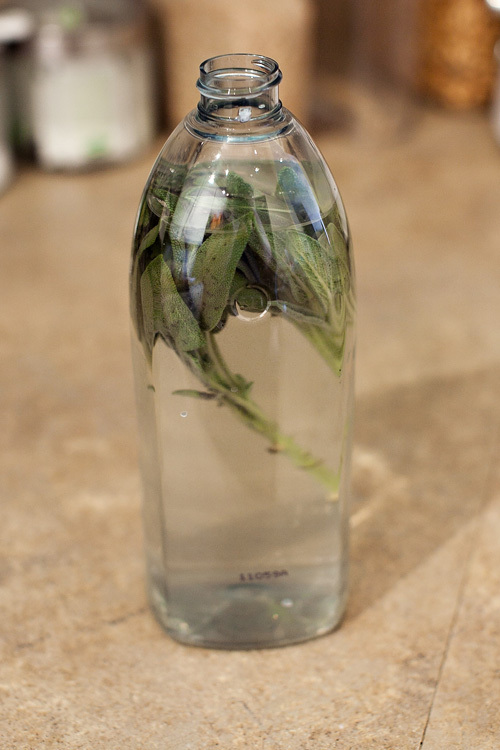 Put your leaves in the bottle and muddle them with a wooden spoon handle. You can also just twist them up or squeeze them in your hand. This activates the leaves to produce their natural oils. 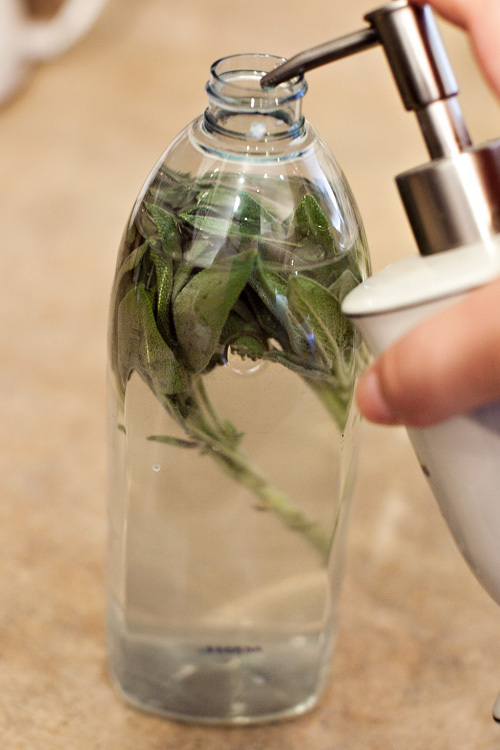 Make sure your herbs are very fresh so you get as much scent as possible from them. It’s really hard to completely mask the smell of vinegar but that’s just the price we pay for DIYing it. The smell quickly dissipates when it dries so it’s fiiiiine. The mixture is easy. 1 part warm water, 1 part vinegar, 1/2 part alcohol. Add a DROP of dish soap and shake it up. The sage will permeate the mixture with its oil. 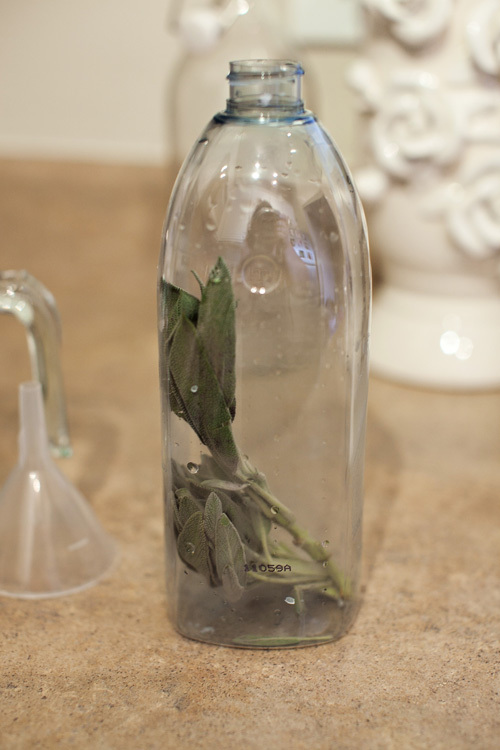 Not only does it help cut the alcohol and vinegar scent some but Sage oil also acts as a natural antibacterial component. There you go! Sage all-purpose spray cleanser.